Reproduced below is the text of the Czecho-Slovak declaration of independence, issued by the Paris-based Provisional Government on 18 October 1918. 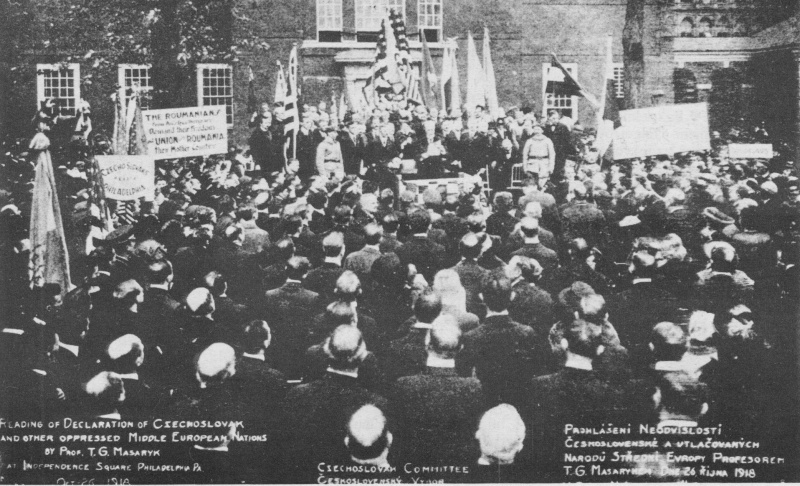 „At this grave moment, when the Hohenzollerns are offering peace in order to stop the victorious advance of the allied armies and to prevent the dismemberment of Austria-Hungary and Turkey, and when the Hapsburgs are promising the federalization of the Empire and autonomy to the dissatisfied nationalities committed to their rule we, the Czecho-Slovak National Council, recognized by the allied and American Governments as the Provisional Government of the Czecho-Slovak State and nation, in complete accord with the declaration of the Czech deputies made in Prague on January 6, 1918, and realizing that federalization and, still more, autonomy, means nothing under a Hapsburg dynasty, do hereby make and declare this our declaration of independence. We do this because of our belief that no people should be forced to live under a sovereignty they do not recognize and because of our knowledge and firm conviction that our nation cannot freely develop in a Hapsburg mock federation, which is only a new form of denationalizing oppression under which we have suffered for the past 300 years. We consider freedom to be the first prerequisite for federalization, and believe that the free nations of central and eastern Europe may easily federate should they find it necessary. We make this declaration on the basis of our historic and natural right. We have been an independent State since the seventh century, and in 1526, as an independent State, consisting of Bohemia, Moravia, and Silesia, we joined with Austria and Hungary in a defensive union against the Turkish danger. We have never voluntarily surrendered our rights as an independent State in this confederation. The Hapsburgs broke their compact with our nation by illegally transgressing our rights and violating the constitution of our State, which they had pledged themselves to uphold, and we therefore refuse longer to remain a part of Austria-Hungary in any form. We claim the right of Bohemia to be reunited with her Slovak brethren of Slovakia, once a part of our national State, later torn from our national body, and fifty years ago incorporated in the Hungarian State of the Magyars, who, by their unspeakable violence and ruthless oppression of their subject races, have lost all moral and human right to rule anybody but themselves. The world knows the history of our struggle against the Hapsburg oppression, intensified and systematized by the Austro-Hungarian dualistic compromise of 1867. This dualism is only a shameless organization of brute force and exploitation of the majority by the minority; it is a political conspiracy of the Germans and Magyars against our own as well as the other Slav and the Latin nations of the monarchy. The world knows the justice of our claims, which the Hapsburgs themselves dared not deny. Francis Joseph in the most solemn manner repeatedly recognized the sovereign rights of our nation. The Germans and Magyars opposed this recognition, and Austria-Hungary, bowing before the Pan-Germans, became a colony of Germany and, as her vanguard to the East, provoked the last Balkan conflict, as well as the present world war, which was begun by the Hapsburgs alone without the consent of the representatives of the people. We cannot and will not continue to live under the direct or indirect rule of the violators of Belgium, France, and Serbia, the would-be murderers of Russia and Rumania, the murderers of tens of thousands of civilians and soldiers of our blood, and the accomplices in numberless unspeakable crimes committed in this war against humanity by the two degenerate and irresponsible dynasties. We will not remain a part of a State which has no justification for existence and which, refusing to accept the fundamental principles of modern world-organization, remains only an artificial and immoral political structure, hindering every movement toward democratic and social progress. The Hapsburg dynasty, weighed down by a huge inheritance of error and crime, is a perpetual menace to the peace of the world, and we deem it our duty toward humanity and civilization to aid in bringing about its downfall and destruction. We reject the sacrilegious assertion that the power of the Hapsburg and Hohenzollern dynasties is of divine origin; we refuse to recognize the divine right of kings. Our nation elected the Hapsburgs to the throne of Bohemia of its own free will and by the same right deposes them. We hereby declare the Hapsburg dynasty unworthy of leading our nation, and deny all of their claims to rule in the Czecho-Slovak Land, which we here and now declare shall henceforth be a free and independent people and nation. We accept and shall adhere to the ideals of modern democracy, as they have been the ideals of our nation for centuries. We accept the American principles as laid down by President Wilson; the principles of liberated mankind – of the actual equality of nations – and of governments deriving all their just power from the consent of the governed. We, the nation of Comenius, cannot but accept these principles expressed in the American Declaration of Independence, the principles of Lincoln, and of the declaration of the rights of man and of the citizen. For these principles our nation shed its blood in the memorable Hussite Wars 500 years ago; for these same principles, beside her allies, our nation is shedding its blood today in Russia, Italy, and France. We shall outline only the main principles of the Constitution of the Czecho-Slovak Nation: the final decision as to the constitution itself falls to the legally-chosen representatives of the liberated and united people. The Czecho-Slovak State shall be a republic. In constant endeavour for progress it will guarantee complete freedom of conscience, religion and science, literature and art, speech, the press, and the right of assembly and petition. The Church shall be separated from the State. Our democracy shall rest on universal suffrage; women shall be placed on an equal footing with men, politically, socially, and culturally. The rights of the minority shall be safeguarded by proportional representation; national minorities shall enjoy equal rights. The government shall be parliamentary in form and shall recognize the principles of initiative and referendum. The standing army will be replaced by militia. The Czecho-Slovak Nation will carry out far-reaching social and economic reforms; the large estates will be re-deemed for home colonization; patents of nobility will be abolished. Our nation will assume its part of the Austro-Hungarian pre-war public debt; the debts of this war we leave to those who incurred them. In its foreign policy the Czecho-Slovak Nation will accept its full share of responsibility in the reorganization of eastern Europe. It accepts fully the democratic and social principle of nationality and subscribes to the doctrine that all covenants and treaties shall be entered into openly and frankly without secret diplomacy. Our constitution shall provide an efficient, rational, and just government, which will exclude all special privileges and prohibit class legislation. Democracy has defeated theocratic autocracy. Militarism is overcome – democracy is victorious; on the basis of democracy mankind will be recognized. The forces of darkness have served the victory of light – the longed-for age of humanity is dawning. We believe in democracy – we believe in liberty – and liberty evermore. Professor Thomas G. Masaryk, Prime Minister and Minister of Finance. General Dr. Milan R. Stefanik, Minister of National Defence. Dr. Edward Benes, Minister of Foreign Affairs and of Interior.